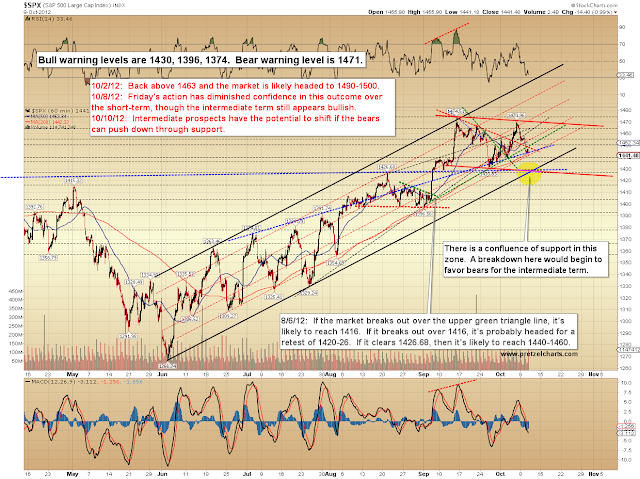 Tuesday saw continued downside -- and as I warned in the last article, bulls indeed "dropped the ball" for the near-term. Currently, it's expected that this is only an extension of the correction from the 1474 pivot high, and that it will ultimately resolve higher over the intermediate term. Bears do have a shot to turn the decline into something more meaningful, but will need to force a decisive breakdown of support to begin shifting intermediate prospects to their favor. The S&P 500 (SPX) trendline chart below highlights a pivotal confluence zone, which crosses 1425-1430. 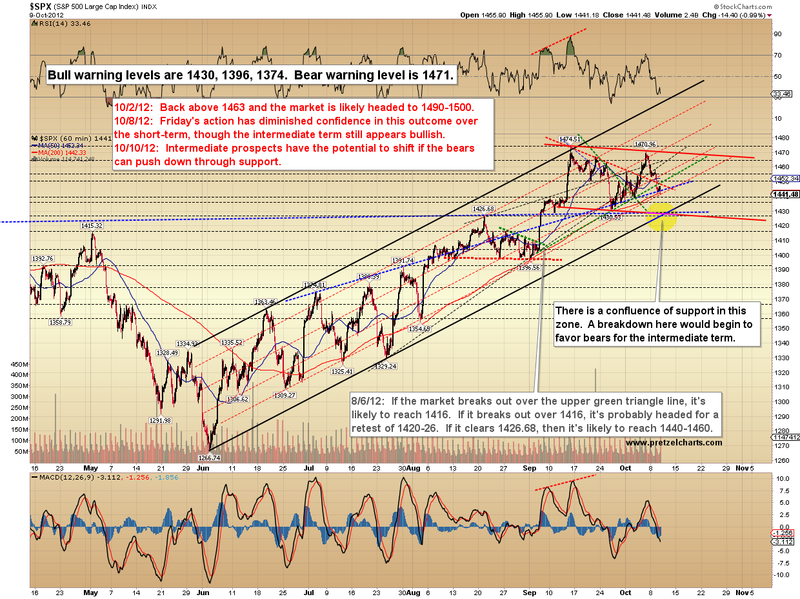 The chart should also note 1453 as a bear warning level. 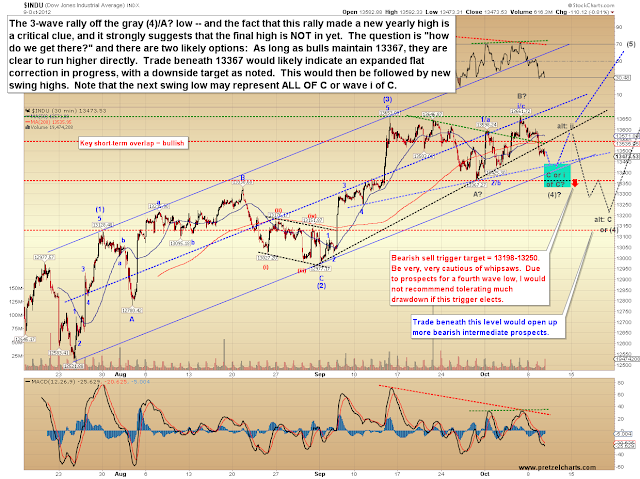 It appears reasonably likely that the market will test this zone before this wave is complete. Keep in mind, however, that bears do not particularly want to see overlap with the blue wave (1) low (chart below) in the near term, since this would imply a potential for new swing highs more directly. We can count a clear five-wave decline, which means the decline has already completed the minimum expectations for a (c) wave, and as such isn't required to head lower. Lower would be more "normal" though, so on the chart below, I've positioned the (3), (4), and (c) labels to reflect the roughly-expected path of a typical (c) wave. A choppy sideways/up mess is the usual for wave (4), which could start quite soon. It currently appears likely that the next swing low will mark ALL OF wave (c)-down, but the potential does exist for it to mark only wave i-down of (c), which would be corrected by a rally in wave ii-up of (c). 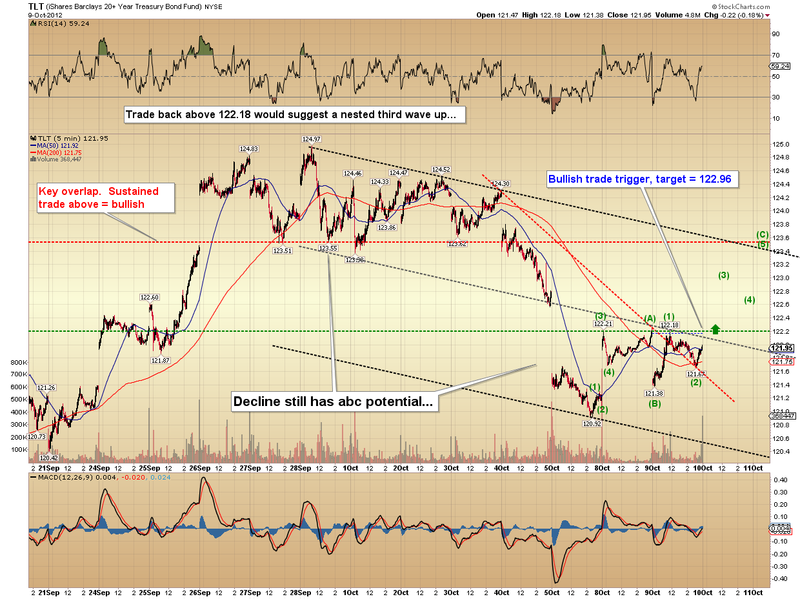 We'll watch the structure as it unfolds to determine if the next rally is corrective (alt: ii) or impulsive in nature. Keep in mind that, as always, I am working within the space constraints of the chart and am not intending to project a time-component, only the price structure. 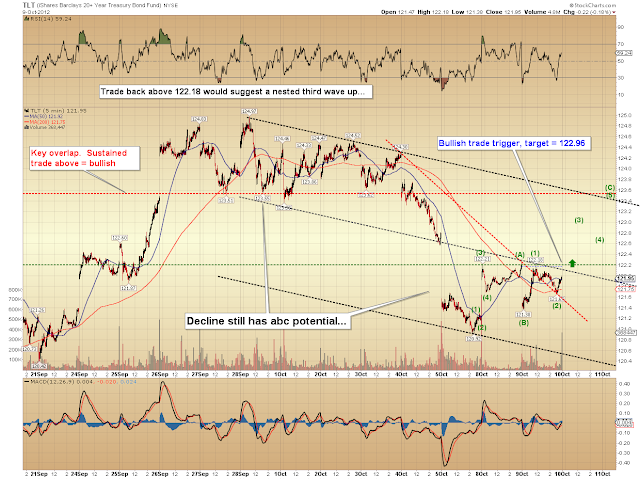 Finally, a quick update on the iShares Barclays 20-year Treasury Bond Fund (TLT). As long as bond bears maintain the wave (A) high, they are in the clear to push lower -- but a break of the level outlined would give bond bulls an opening to push this market rapidly higher over the near-term. In conclusion, while five waves down can already be counted in the decline from 1470 SPX, it does appear likely that the near-term weakness will continue for several more sessions. Conversely, trade back above the blue wave (1) pivot low (2nd chart) would suggest that weakness is over. 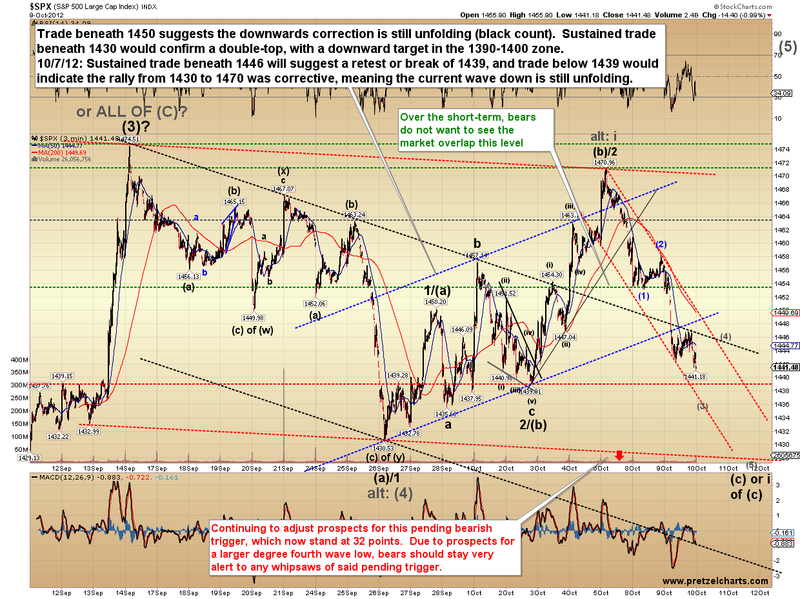 For the intermediate term, there are presently no indications that this wave is anything other than an ongoing correction, meaning the rally is likely to continue to new swing highs when it completes -- however, any breakdowns of key intermediate support will call for more bearish prospects to be considered. Trade safe. 3 things I want to tell you that I consider important, occuring right now, and that you might not be aware of (since I have not seen it in any of your daily writings). and I am telling you because I am interested in reading what you think about both issues, which I am fairly sure, you will also find of interest. 1st thing is this---I know you are always discussing the importance of similarities in fractal shapes, whether short or long term. and, what I want to point right out now, is the uncanny striking similarities of 2 other important fractal shapes, lasting approx. 13 months each, in both cases (and also occuring from september to october, in both cases)---of the 13 months' fractal of sept.2011-oct.2012, and... the fractal of... sept.1986-oct.1987. so look at them together, they are so similar, you can nearly overlap them, into 1 shape. second thing is---I have long thought (in practically total opposition to the entire world) that gold is extremely OVERvalued, since I continue to strongly opine, that the world is soon to enter a multi-year phase of massive world DEflation--and NOT what most expect, which a continuation of apparent FED-created fiat-dollar deconstructive devaluations. however, until recently, I had not been able to find anything, to CHARTwise prove my thesis, of gold's extreme OVER-valuation (and despite the -IMO- utterly insane gold bullishness out there everywhere right now, even down to cabdrivers and shoeshine boys, just like in baruch's time). But now I believe I've found someone that has properly charted this current gold OVER-valuation, and it is in the most logical simplistic manner: gold price/crb index. I saw a longterm chart a few weeks ago (can't recall the charter, I look at many charts daily), that clearly showed that gold is now at nearly THREE hundred % OVER-valuation of it's normal 30+ yr. range, in relation to it's most directly proper comparable: basic human-living commodities, the crb index. and what the 31 yr. chart showed was this (chart was started in 1971, year of u.s.a.'s gold-window closing, probably the most defining financial event of the 20th century)---chart showed that for nearly 30 years, the range ratio of price of gold vs the crb index, always stayed between 1.1 and 2.2 (and this INCLUDED the massively INflationary early 70's to early 80's, believe it or not, where it hit 2.2 ratio in 1981's gold spike to $850). however... when you look at the last 3 years (2010-2012) of this gold/crb charts... what you see is a IMO -hysteric- explosion of gold OVER-valuation, never seen before, in relation of gold price to basic human-living commodities... since over last 3 years, the chart spikes nearly straight up, to reach an incredible 6.0 gold/crb ratio, in 2011 top... (and it isn't much lower now either, around 5.7, if I remember correctly). that would mean that gold right now should be somewhere between $400 and $700 dollars an ounce, believe it or not. 3rd thing is---something else of current consequence---s&p500 insiders are right now selling their shares at a ratio of 40sold per 1bought. 40-1, insiders of big public companies, are selling. and as the old saying goes, insiders sell for many reasons, but not because they think their stock's price is going higher. "the price of liberty under the law as it is currently interpreted is to pay off debts and taxes in USD rather than gold. Since USD pays our debt and taxes (and gold does not) gold becomes less valuable as having adequate sovereign currency to pay taxes and transact purchases is paramount.